Engraving costs £45 for up to 60 characters (including punctuation and spaces), and £10 for every 15 characters after that, to be engraved on the "afternoon" side of the gnomon. A logo can be incorporated at extra cost (around £60) if required - please Email us with the logo as an attachment for a quotation. The size of the characters will be designed to allow your selected text without crowding. If you would like to have both sides of the gnomon engraved, the second side can be done at the same prices. 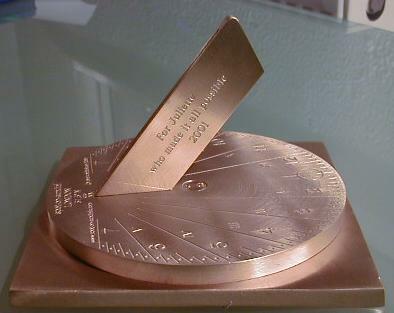 If you would like to have both sides of the gnomon engraved, the second side can be done at the same prices.